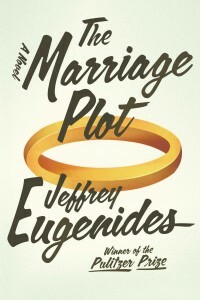 The Marriage Plot, a novel by Jeffrey Eugenides, Farrar, Straus and Giroux, New York, 2011, 406 pages, $28.00 cloth. "Every letter is a love letter." (p. 221) So thinks Mitchell Grammaticus, the ostensible hero of Jeffrey Eugenides's latest novel, as he reads a 'break-up' note from Madeleine Hanna, his close friend and one-sided love interest. His point: no matter what an author intends, what's written emerges from the primordial ooze of love. One could also claim that every story is a love story. The Marriage Plot easily fills this role but also plays with the expectations a love story suggests, like a cat batting a toy mouse around a small room. The Marriage Plot, of course, takes its title from the formula made popular by some of the book's heroine, Madeleine's, idols—Austen, Eliot, the Brontës—in which a lower-class lover is able to attain an ideal suitor through carefully prescribed trial and tribulation. Though none of the novel's three main characters are of diminished social standing (Madeleine's object of affection, Leonard Bankhead, comes from a less-than-comfortable upbringing but still boasts an antiques-dealer father and a Brown education), they play typical "marriage plot" roles of breathless heroine, dashing savior, and shrewd social observer in sometimes conventional but also often surprising ways. The genius of Eugenides's exploitation of plot formula is that The Marriage Plot falls into its own generational trap while flaunting its subversion of its title's requirements. The novel does not mimic the successful courtship dance of Madeleine's favorite Victorian novels, but rather the open-ended unresolved quality readers have come to expect from contemporary literary love stories. Considering the prodigious and minute control the author has previously demonstrated over complex narratives like the Pulitzer Prize-winning Middlesex, this is likely intentional. Eugenides's divergent-yet-conformist take on the standard plotlines of multiple eras raises the larger question of when the current 'plot' will fall out of fashion—making his conformity anything but a cop-out. Set in the months surrounding Madeleine, Mitchell, and Leonard's 1982 graduation from Brown University, the novel's stomping grounds are alive with the implications of the leftover feminist ideals and new deconstructionist criticism permeating academia in the early eighties. The characters throw around the ubiquitous names of Derrida and Saussure like old friends and read Barthes with the hunger that later generations of college students will reserve for Harry Potter. Eugenides takes full advantage of this social and literary stew. His protagonists seem to apply the literary theories they study directly to their own narrative, creating an internal critical conversation the pretentious students in Madeleine and Leonard's semiotics class would likely enjoy. Their classmates "wanted to demote the author…wanted the reader to be the main thing. Because they were the reader." (p. 42) With clever self-effacement and a nod through the fourth wall, Eugenides dares his reader to do the same thing to The Marriage Plot and see what happens, giving space to the thought that a book can exist simply as the sum of its parts, without any semiotic tinkering, while still referencing the dense theoretic material that expert readers will want to apply. It is an ingenious wink to the fact that authors want to be considered both intellectual by connoisseurs of complex literature and also palatable by mainstream book buyers. Madeleine, for example, is of the camp that prefers to leave literary theory out of the equation. An English major writing her undergraduate thesis on the very marriage plot from which this novel takes its title, Madeleine wants to understand the intricate inner workings that semiotics says can be found in her favorite stories, but she finds the process nearly impenetrable. Madeleine thinks "a writer should work harder writing a book than [Madeleine] did reading it. When it came to letters and literature, Madeleine championed a virtue that had fallen out of esteem: namely, clarity." (p. 42) With this, Eugenides gives permission—as far as an author's permission is important—for the reader to just enjoy his book. "Reading a novel after reading semiotic theory was like jogging empty handed after jogging with hand weights," (p. 47), Eugenides says through Madeleine, again remarking on the duality and varying depth of readings possible in The Marriage Plot. But Eugenides goes beyond allusions to semiotic texts to reinforce that idea that we view all narratives through the lens of others. He also employs a vast range of other literary sources to help move the plot along or simply underscore various thematic elements. For instance, after a disastrous attempt to fulfill The Marriage Plot herself, Madeleine returns to live in her childhood bedroom, which is covered in wallpaper made from the pages of Madeline children's books. She sees in the fading paper not only the obvious loss of innocence, but the loss of a simple narrative in life, as a woman and as a character. (The fact that this wallpaper is mostly yellow is surely not an accident.) And in the midst of a manic-depressive breakdown, Leonard dons a bizarre, furry hunting hat that echoes the headwear of J.D. Salinger's most famous unstable protagonist. Mitchell carts a veritable library across Europe and into India on his post-graduation trip, using books as his main source of enlightenment in a trek of religious exploration. He finds nothing but shame and disgust in helping Mother Teresa serve the destitute, but experiences the closest thing to an awakening when he begins reciting the Jesus Prayer relied upon by another Salinger character, Franny of Franny and Zooey. All the while, the specter of India hovers in the background, just as it did in so many of the original marriage plots of the Imperial and Victorian eras. Anywhere a reader looks in The Marriage Plot, a dozen other texts are on the novel's horizon. Because he utilizes the implications of so many other stories in this novel, it is only natural that Eugenides would call in his own previous work as well. The love story in The Marriage Plot is not the kaleidoscopic, decades-spanning mythology so brilliantly imagined in the epic Middlesex. The character most closely resembling the author—like Eugenides, Mitchell grew up in Detroit and later volunteered for Mother Teresa—does visit the previous novel's spawning ground, Greece, during his year of soul seeking. But aside from that quick visit, Eugenides seems eager to dismiss the readers' potential notion that The Marriage Plot is more than peripherally linked to his 2003 masterpiece, providing only a few cursory lines that allow readers to move on from their own love story with Middlesex. Returning briefly from Brown to his Midwestern hometown, Mitchell observes, "Now his Greek grandparents were dead, Greektown becoming a kitsch tourist destination, and Mitchell just another suburbanite, no more Greek than the artificial grapes hanging from the ceiling." (p. 146) By quickly dismissing any setting associated with Middlesex, Eugenides implores us to accept his newest novel for what it is and not what came before it—another semiotic consideration. How The Marriage Plot succeeds may be best described by Madeleine herself, when she attends a Victorianist conference at which panelists incorporate the feminist and queer literary theory becoming popular at the time. She discovers that this is what she wants to do with her life: "They were talking about all the old books she loved, but in new ways." (p. 177) Again, Eugenides uses his protagonist's epiphany to emphasize how every text is influenced by others, and how readers can use other literary works to approach a particular story in infinite ways. As the novel begins, "look at all the books." (p. 3) In reading The Marriage Plot, we can't help but. Jessy Goodman is an MFA student in fiction at San Jose State University. She recently moved to the Bay Area from Los Angeles.